I'll be at Clexacon, March 3-5, in Las Vegas! Stop by booth #804! Holiday Discount All Through December! Upon checkout, please use the code to receive your discount. Happy Holidays!! 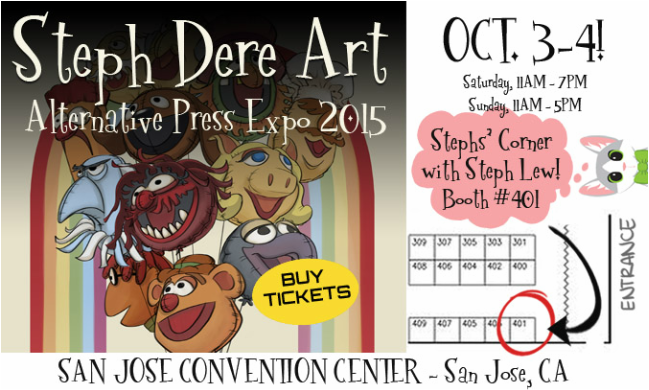 Just letting you guys know I'll be Alternative Press Expo (APE) 2015 this year, Oct. 3-4, at the San Jose Convention Center in San Jose, CA! I'll be selling new prints, T-shirts, pins, and bags - rounding out content from Sherlock to Muppets, to Game of Thrones and Orange is the New Black!